The Demo : Recorded in their basement on an 8 track. Taking a page out of the ‘Never’ book, Colin shoots back with a pure punk rock demo. This also features Carrie, a girl punk bass player, which was different. This would only be a one off project. The highlight is the song ‘Tomorrow Night’ & a cover of Bad Religions ‘Only Gonna Die’. Watch the Video below to hear samples from the release. Listen here : http://www.last.fm/music/The+Beatjunkies/+tracks or here. 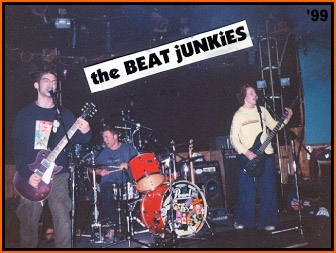 Been aching for years to have a copy of The Beat Junkies album.